I feel a little bit like I’m cheating by posting this as a ‘recipe’ as such, but I recently discovered that not everyone knows about frozen bananas! I was chatting to a friend the other day who told me how she had bought a Yonanas machine, at which I was a little horrified because its just frozen bananas, but that made me realise not everyone knows that frozen bananas make great ‘ice cream’ even without a shopping channel gizmo. Prep – whenever you have some really ripe bananas in the house, don’t throw them out! Peel them, wrap in cling film and pop them in the freezer. Method – take out your frozen banana and cut it into a few pieces. Pop it in a food processor (or you can use a really good blender), add a little something to help it blend like some yoghurt or a dash of milk. Whizz it all up until smooth. Put it into a container and pop it back in the freezer for 30mins to 1hr to firm up a little. After that time, eat it and enjoy! The banana takes on a creamy ice cream like consistency, so it tastes just like banana ice cream but its good for you! 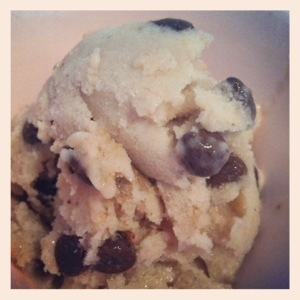 You can also stir through some chocolate chips to make banana choc chip ice cream if you want. Likewise you can stir through some liqueur to make an adult version, plus if you plan to leave it in the freezer for longer, the alcohol will keep it soft as it will never completely freeze. I know this is not much of a ‘recipe’ but its for all those people that don’t know about frozen bananas, so go on and give it a try! This sounds delicious! And perfect for those of us who are trying to cut back on sweets, yet crave them constantly!! 🙂 I’m going to have to give this a try!